What Is Delphi and How Is It Used? By using the Cross platform CLX component library and visual designers, high-performance portable applications for Windows can be built that can be easily recompiled on Linux. All the common parts of the Windows graphical user interface such as forms, buttons, and lists are included in Delphi as components, meaning you don’t have to write any code when adding them to your application. 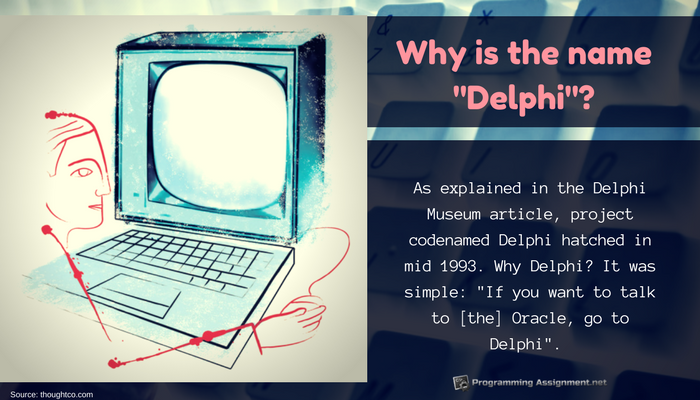 Specialized programs such as web browsers can be created in a matter of minutes using Delphi. Academic assignments – Homework assignments that you are having trouble with need not worry you. We offer assistance with programming homework assignments that ensure you have working code solutions for every problem. Personal tutoring – We can design Delphi programming tutorial assistance, customized to suit your specific needs. Your programming level and experience are taken into consideration when we design your personal tutoring program. You select the times you want to schedule tutoring sessions based on your schedule, not ours. Delphi programming help is available for any aspect of Delphi you are having difficulty with. Our programmers are well qualified to provide the precise help you need. For superior quality programming help that won’t break your budget, contact us for all of your programming help needs.